Oh Yeah, Great Sunsets too. Enhance Your Personal and Business Relationships Aboard Rainy Lake Houseboats’ Flagship, the Chairman II. The Chairman offers you a one of a kind setting setting for a premier wilderness fishing experience. A staff that delivers a full American plan caters to your every need and includes Chef, U.S. Coast Guard licensed fishing guides (one guide for every two fisherman), phenomenal food, and premier accommodations. You cannot find another resort or houseboat venue like it on Rainy Lake, in Voyageurs National Park or Northwest Ontario. No hassles, no border crossings, just plain put your feet up and let us do the rest. Perfect for customer reward programs, employee incentives, team-building and client entertainment, or a friendly fishing trip. A trip on the Chairman is a great way to combine business and fun. 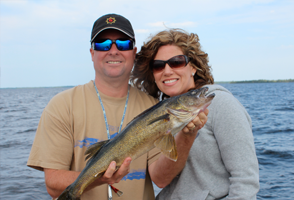 The fishing on Rainy Lake is phenomenal; a Canadian fly-in fishing trip is not the only way to experience great fishing! 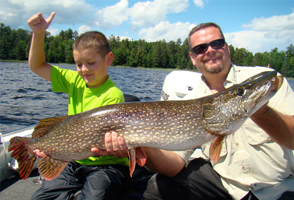 From ice-out in early May to mid-October, there is no “bad time” to visit and catch fish. 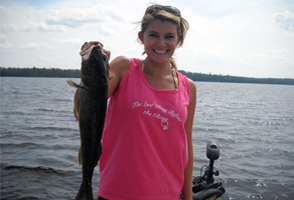 Our captains are some of the best guides in Minnesota with expertise in catching walleye, small mouth bass, pike, musky, crappie, perch, and sturgeon. You need not be an expert to fish on the Chairman; your guide will put you on the fish and teach you the techniques needed to catch them. The Chairman customer’s fish in the finest guide boats in the industry either famous Lund Pro V IFS’s or Ranger walleye boats. All have pedestal seats; electric trolling motors, full wind shields, fuel efficient, environmentally friendly motors, and are 19 ½ to 20 ½ feet long. Groups of 6-10 people are hosted aboard the Chairman itself. To accommodate larger parties, we moor multiple houseboats together with the Chairman II as the main gathering place. We employ the finest staff in Northern Minnesota who’s only concern is making sure you and your guests relax and enjoy the grandeur of Rainy Lake. Since the captain takes care of the operation and mooring of the houseboat and our excellent chef prepares the menu we create to meet your tastes and dietary needs, you have plenty of time to fish, take in your magnificent wilderness surroundings, and strengthen relationships. A captain and the chef remain onboard in private crew quarters each night. An unforgettable fishing experience awaits you. Make the Chairman II from Rainy Lake Houseboats the host of your next getaway and you will discover why many groups come here year after year.